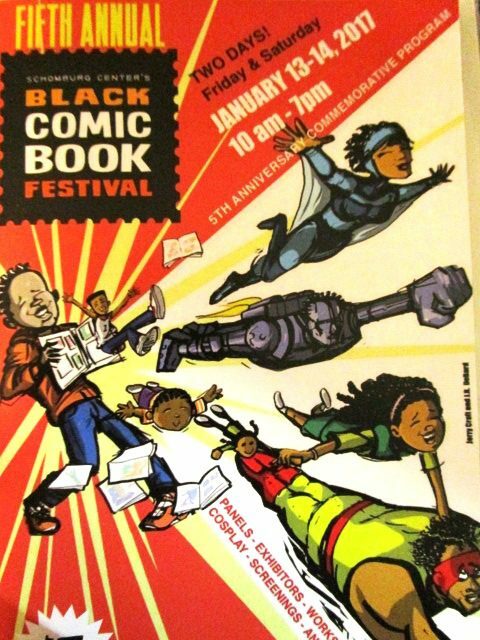 It’s the Little Con That Could – from its very first year in 2012 with a modest attendance, The Black Comic Book Festival has reached its 5th year and it’s grown remarkably. This year, the event expanded to two days, Friday and Saturday with full programming till 6-7 PM. It was very gratifying to see so many parents and children scoping out the works of independent artists and writers. 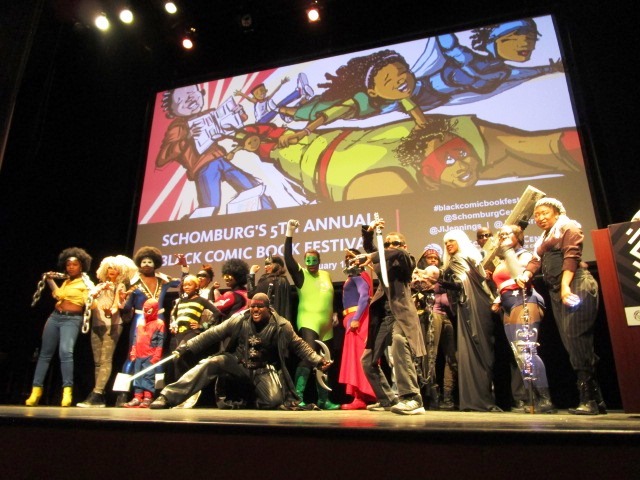 Even when it got to critical mass on Saturday afternoon and the Schomburg Center (for Research in Black Culture) couldn’t contain more, there was that spirit I’ve encountered at comic cons – keep it moving. Shuffle, side step, angle the body and shoulder through or just stop till a space opens. No biggie. For sure no one was leaving without seeing it all. So I got my belated copy of WATSON AND HOLMES Vol. 2. Can hardly believe I missed it when it came out in May! I’ll never underestimate the value of social media links again. Also excited by BLACK, a new series under an independent publisher, Black Mask. I bought issue 1 and after reading it during a lull in panels, went back for the next two – it’s serious and fun. Another fan is born. 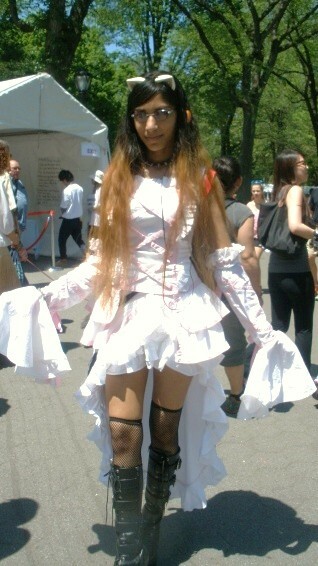 And the Cosplay was real! 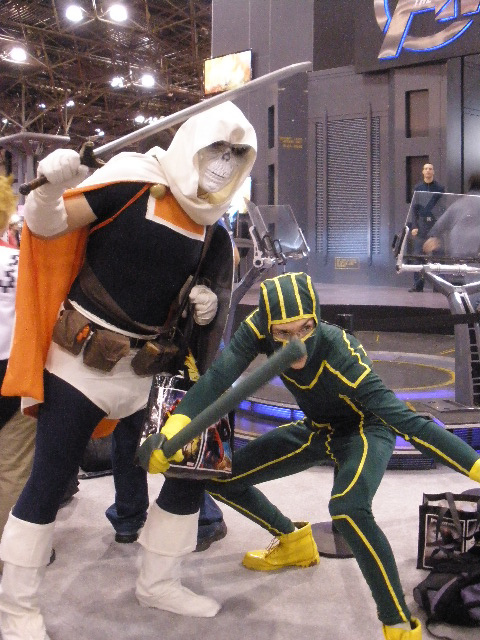 I can say these enthusiastic costumers could grace the best of comic cons anywhere! Storm was strongly represented by at least 3 wonderful variations, right down to the whites of her eyes. Luke Cage could not look better in crayola yellow heels and tied yellow blouse. I loved them, and the audience roared their appreciation as well. Well done, all! A tribute panel to artist, comic book creator, publisher and entrepreneur David Anyabwile for his beloved comic book series, BROTHERMAN, was very inspiring. He spoke earnestly of his childhood, how a caring family life nurtured his love of drawing and telling stories about being black and proud. The festival was developed by Deirdre Hollman, Director of Education and Exhibitions at the Schomburg Center, who was seeking new ways to enhance educational projects for the Junior Scholars Program. After connecting with John Jennings and Jerry Craft, visionary artists, the idea of a comic festival utilizing black talent became their mission. They have been united in continuing to improve the festival, with great success, indicated by the increasing attendees and artists each year. The Schomburg Center has been a benevolent host to this event, as they also maintain library research hours while keeping it all orderly upstairs. Big hugs and thanks for sharing. It may seem small, but the Black Comic Book Festival is big where it counts – talented artists, attention worthy panels and unlimited creative energy that’s infectious. I hope this con keeps going and going till some child (or children) in the audience is one day a published comic artist or writer, sharing what they learned right where they learned it. Missed it? It’s back next year – make it a date! They sure know how to throw a party! Perfect spring weather, Kabuki face painting, robotech contests, kickin’ martial arts demos, calligraphy and my fave – taiko drummers were all thrilling the crowds today. Attendees were also feted with free samples of Japanese culinary treats such as gyoza, sushi, noodles and complementary cans of Oolong Shot, a new energy drink. Many, many takers stood on winding lines for a taste. Oh, did I mention that Cos Players adorned the festivities? 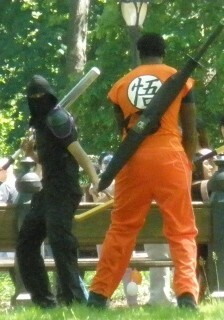 Gotta love those guys and gals who take their favorite anime characters and bring them to life for all to see. There was also a free hug from one, how much friendlier can you get?